It has finally cooled off here! I am one of those people that only likes soup during cooler weather. (Not sure why, I eat hot things during the summer, just not soup or chili!). But, as soon as there is a crisp, cool breeze, I start to crave hearty soups and stews. Various winter squashes are plentiful right now – butternut, acorn, spaghetti, delicata and, of course, pumpkin. Some grocery stores even have butternut squash peeled, chopped and ready to use. Of course, the cost of convenience is higher but sometimes it’s worth the money! 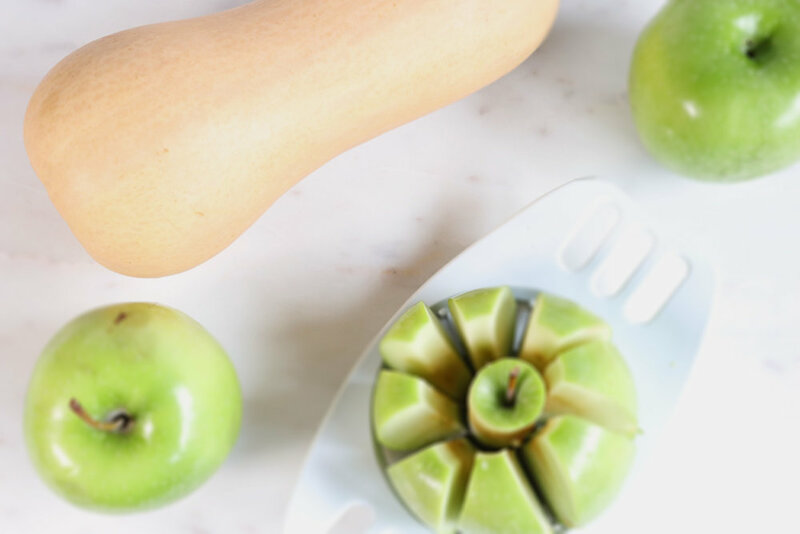 Butternut squash is high in vitamin A, C, potassium and fiber. The orange color of the flesh indicates that it is high in beta carotene, a powerful antioxidant. One-half cup of butternut squash provides over 200% of the daily value for vitamin A! I used a fresh butternut squash for this recipe. Simply peel with a vegetable peeler or sharp knife, cut in half, scoop out the seeds and cut into cubes. Just like with the Slow Cooker Apple Butter with Chia, leave the peel on the apples. The peel just blends right up after cooking (and it is so good for you!). 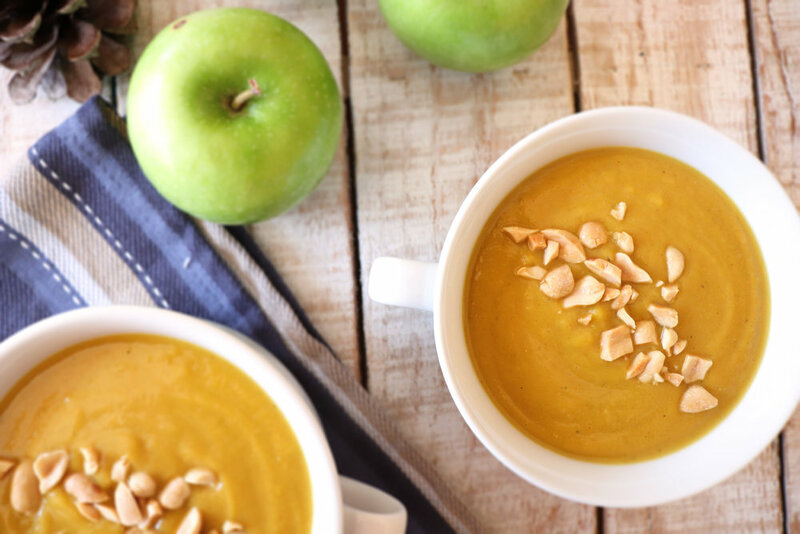 Each cup of this warm, comforting soup has just over 100 calories and provides 25% of your daily requirement for Vitamin A, over 30% of your need for Vitamin C and 4 grams of fiber! Heat olive oil in a large saucepan or Dutch oven over medium high heat. Saute onion until soft, about 3-4 minutes. Add curry powder and ginger and stir until fragrant, about 30 seconds. Add squash and apple, stirring well. Add the vegetable broth and salt. Bring to a boil then reduce heat to simmer. Cook for 15-20 minutes or until squash and apples are fork-tender, stirring occasionally. Blend with an immersion blender or puree in a blender until desired texture (I like a little texture so I don’t blend it completely). Return to the pan and stir in the peanut butter. Serve with chopped peanuts on top, if desired.